FOV=1.8 cm. 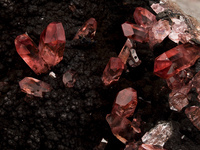 Small but beautifully transparent and deeply colored prismatic rhodochrosite on an oxide matrix, which is presumably Mn-rich. 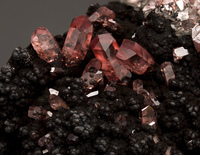 Note that oxide spheres are embedded within the rhodochrosites. 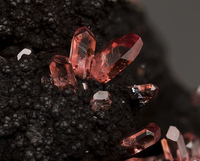 A black, octahedral mineral (more visible in photos 5 and 6) is present in this view and may be an Mn-bearing spinel group mineral. Three stereo views in this series. Collection and photo, T. Peterson.